If you have a small garden like I do, you should think about planting some chives. Plant them once and they’ll return year after year. The only effort involved is knowing what to do with them when they arrive each spring. The most common destination for chopped fresh chives is on top of potatoes or soup. They are excellent in their raw form but even better when you dress them up! Here is a fantastic idea I came across in a 2005 issue of Bon Appetit. 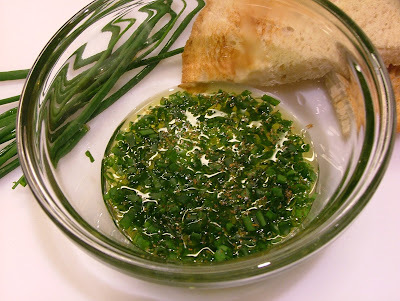 In a blender, puree ¼ cup chopped chives, ¼ cup extra-virgin olive oil with a big pinch of cayenne pepper. Season with a few pinches of salt. It’s delicious drizzled over mashed potatoes. It can also be used as a topping for steamed fish or as a dipping oil for crusty bread. I prefer dips that don’t resemble baby food so as you can see in the picture I have not pureed the mixture. If you decide to do the same I suggest you let the mixture sit for a few minutes. It'll give the flavors a chance to combine together like Simon and Garfunkel, Sonny and Cher, Hall and Oates or Erik B and Rakim before you dig in!